No, I’m not in Hawaii. I am in Arizona! Yay! But Hubby and I did go to Hawaii a few years back with his parents. It was a wonderful trip. I bought some Hawaiian fabric and a book on Hawaiian quilts. Have I ever mentioned how I feel about appliqué? Um, yeah. I cut out exactly one block and fused it to the background with Heat N Bond. And it never got any farther than this. Heat N Bond is not a good product for this application. Not for me anyway. I never did stitch around the edges because it gummed up my machine needle. Anyway, I recently found this ancient UFO and decided it might be a fun piece to practice with on the long arm. I wouldn’t be bothered if I ended up throwing it out. You have to just play now and then. So I loaded it up and tried out a border idea I had. So far, so good. Then I stitched along the edges of the appliqué. Not so good. The speed of the needle heats up and causes the glue to get gummy. This means skipped stitches at best. After cleaning the needle several times, I got around it once and called it good. Then I practiced pebbling in the background. I am not good at this. But knowing it would be better when I wasn’t so close, I soldiered on and bound it by machine. Here it is before washing. 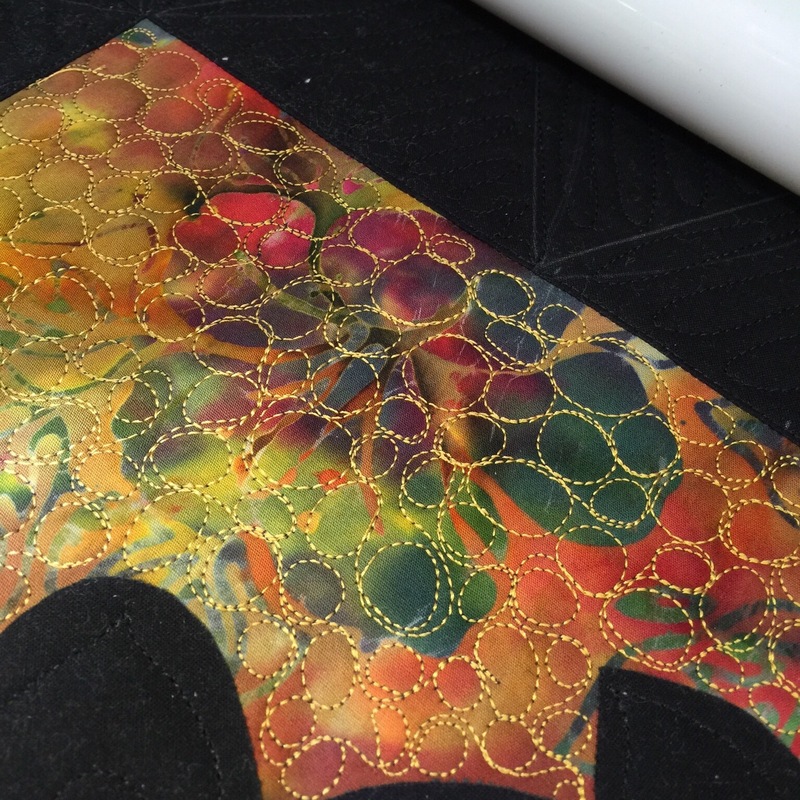 Okay, better than I expected but I wanted to wash and see how the fusing held up. The answer? Not good. Not at all. And it didn’t help that I failed to stitch around those little openings. But I loved the texture of the border and background. So I figured I would try to salvage the mess. I used my walking foot to stitch around the little openings. Then I ironed the darn thing into submission. I think it worked! Not a masterpiece by any stretch, but I rather like it now. I think I’ll keep it. The picture above shows the texture well but the one below shows the actual color best. I learn something from every piece I make. 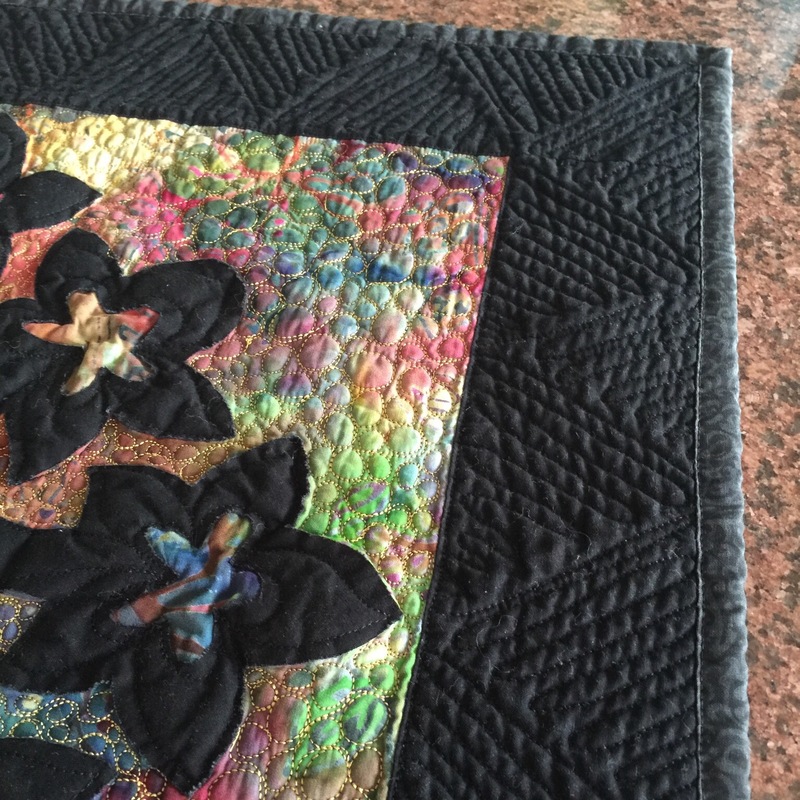 This entry was posted in Finishes, Free Motion Quilting, UFOs, Uncategorized. Bookmark the permalink. 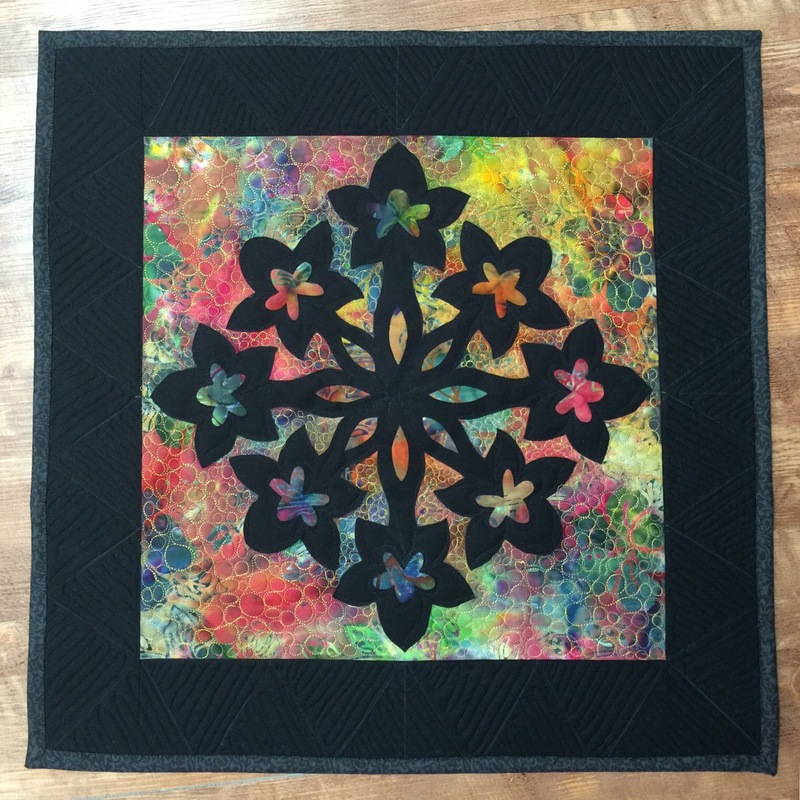 I use Heat and Bond Lite for all my appliquesnowbird and have no problem and no gumming up. The regular weight is way too heavy for quilt weight cotton. Try it out on a sample before you commit it to your project to determine if you like the results. You could also try Wonder Under, which has been around for years also. I think your results are fantastic considering the challenges you had to overcome. That is great! 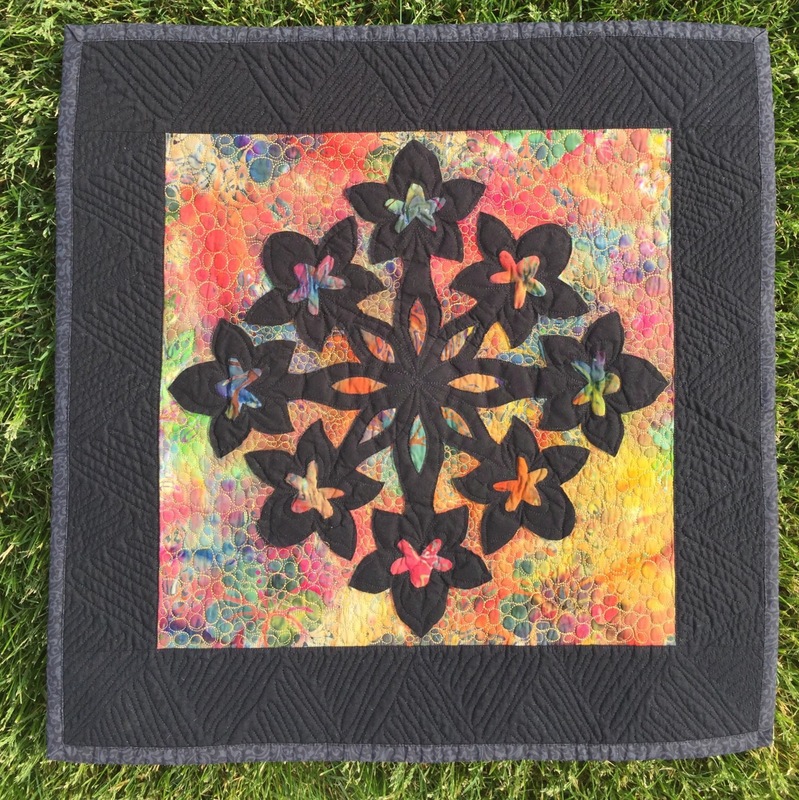 I just finished reading the Aloha Quilter ( or something like that) and your blog post fit right in!! Great job!! You got there in the end, good on you! And believe it or not, I have a little something purchased from Hawaii many years ago too. Maybe I should have a look for it and get on with it too! I love that you ironed it into submission! Actually, I think the quilt looks great even though it may not be perfect. There’s something about it that’s very appealing. 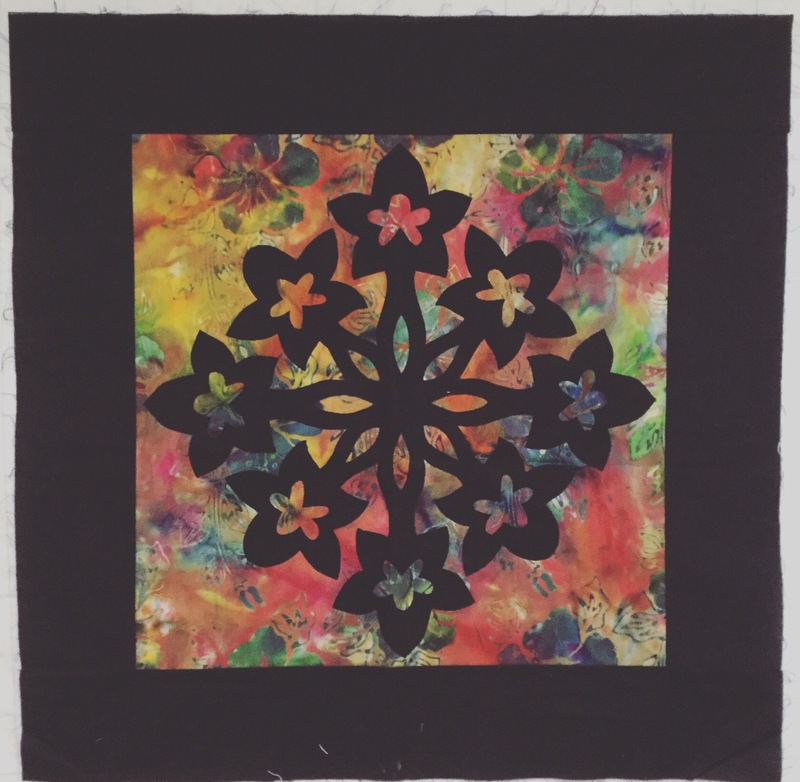 And I think the quilting enhances the fabrics and pattern of the applique. I was reading one of Gwen Marston’s books yesterday and she commented that every quilt does not have the be perfect or the best quilt we’ve ever made. 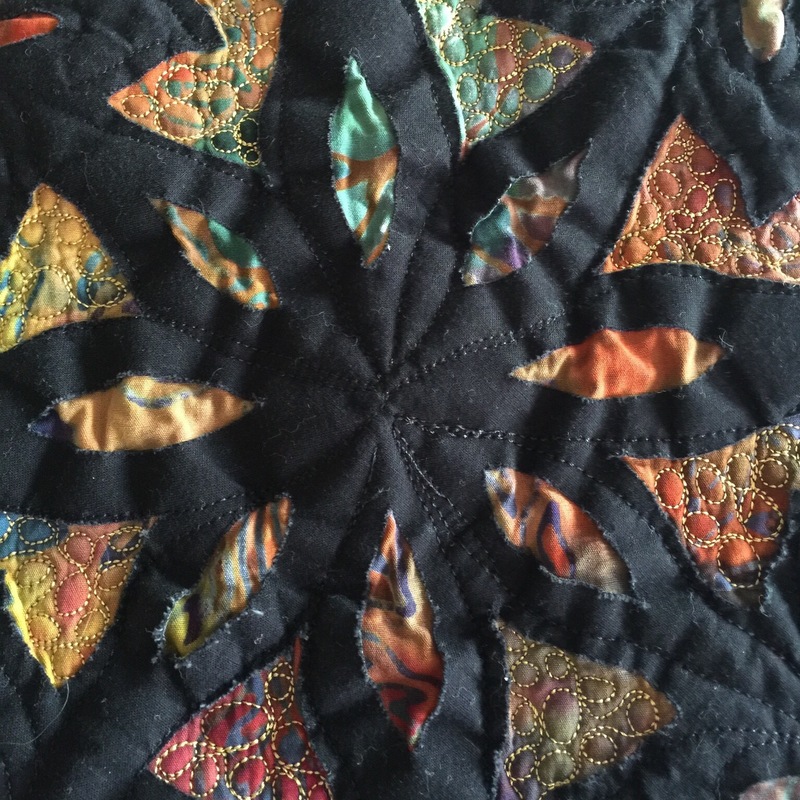 Some quilts are just quilts, other quilts have that wow factor that makes the exceptional, but they’re all good. I think it’s good to try, learn as we go, and then decide whether we want to keep doing what we learned or move to something else. Now if one only ever sees the last picture, or the quilt itself, no one would ever know the trouble you had. It made an awesome save. Perseverance paid off! Way to go! You gave it a shot, learned along the way, and came out with a nice piece. That is a win! It is a very pretty little quilt. You get an A+++ for perseverance. And you learned a lot about that particular fusible! There are surely others which are better. I feel like you do about appliqué and would never have started a Hawaian appliqué or much of any other appliqué project. I do occasionally fuse a little item or some lettering, misty fuse has worked well for me, but it’s always been very minor stuff. “Live and learn” as the old saying goes. 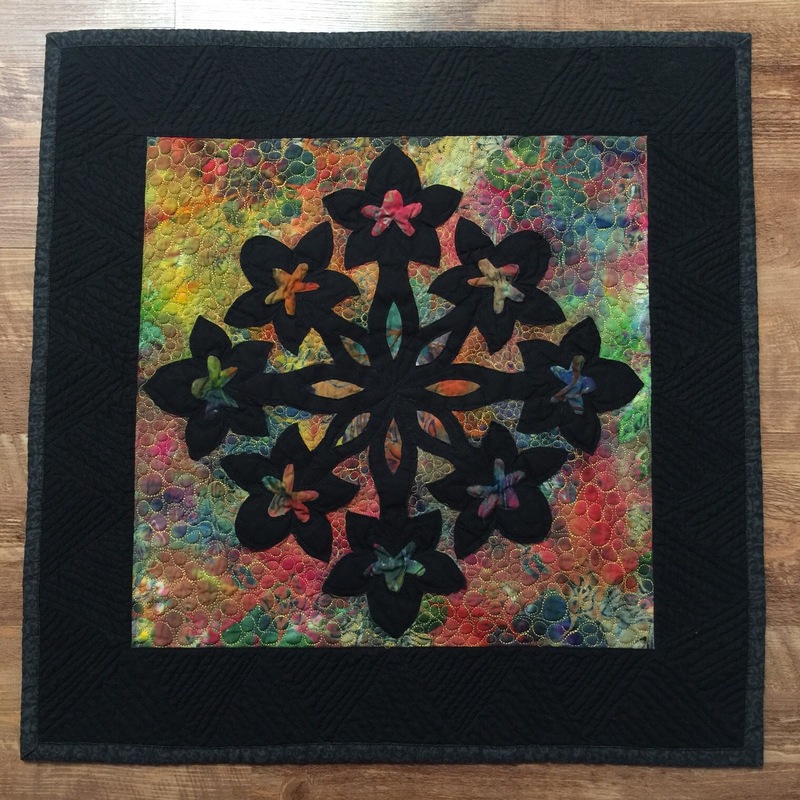 I love the quilting on the dark border. Kudos to you for hanging in there. Well, first I love Hawaii. I applaud you for working through this project from start to finish. It would have been so easy to toss it aside. I love the texture after you washed it. Those borders…delicious! Sometimes you have to whip things in to submission…take the upper hand!! Well, the whole story put a smile on my face! A true, “if at first you don’t succeed…” It came out beautifully in the end! I enjoy seeing your process. 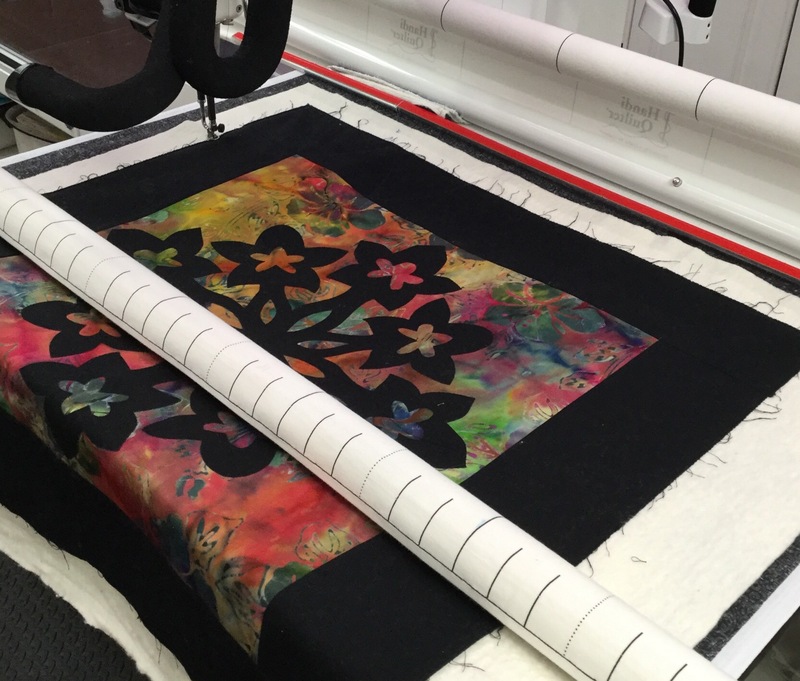 Those learning quilts do seem to work their way into our quilting hearts, don’t they? Thanks for sharing!